Friday, March 29th to Sunday, March 31st, 2019. The keynote speaker will be Dr. Jonathon Adrain of the University of Iowa. The keynote talk will be at 6:00PM on Friday, March 31, 2019. The MAPS EXPO Show will be held March 29-31, 2019, at the Sharpless Auction facility just north of I-80 at Exit 249. The Hotel Pre-Show is scheduled to occupy the Clarion Hotel north of I-80 at Exit 246 on North Dodge Street about 3 mi from Sharpless Auctions. Both venues are located in Iowa City, Iowa. Click on the link below - no password required! 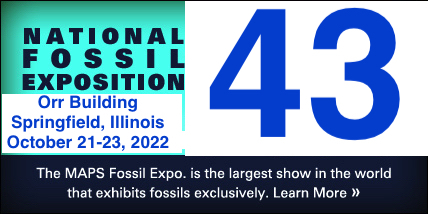 Following EXPO 2019 on March 29-31, the next club activity will be the annual joint field trip with the Cedar Valley Rocks and Minerals Society in the fall, usually October, depending on scheduling. 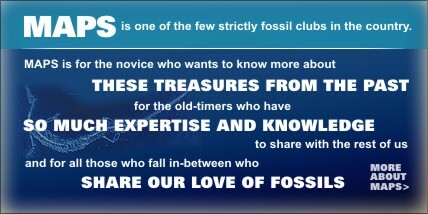 Please send us your fossil/rock club related events to be posted! Your stories are needed for the Digest Newsletter! One comment that popped up from a lot of folks at Expo was that people would enjoy seeing more frequent club newsletters. To do that, we need YOUR STORIES - the Digest Newsletter is member driven, and submissions have dropped off in recent years. The stories do not need to be fancy ultra-scientific things! Such simple topics as a favorite fossil collecting trip story, or a description of some great fossil find of yours would be just the sort of thing we could use in the newsletter! Submit your pictures too - really cool ones just might end up on the cover! Please send your submissions to the Newsletter editors, John Catalani or Chris Cozart; alternately you can contact one of the webmasters - our contacts are listed in the lower right corner of this page. 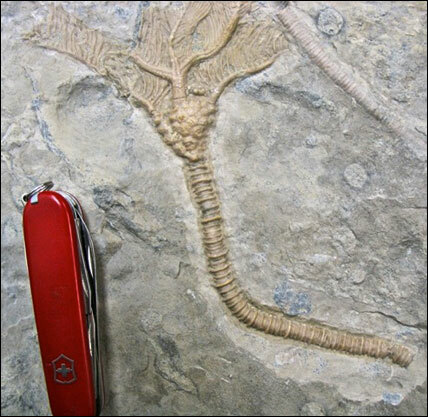 Crinoid fossil found on a club trip to Klein Quarry in Coralville, IA in rocks of the Cedar Valley Group in October 2008 by MAPS member Dennis Sievers. Prepared by MAPS member Karl Stuekerjuergen. Middle Devonian in age - approx 375 million years old. ©2019 MAPS. All rights reserved.